The bad news for RIM: it lost nearly $200 million (adjusted) last quarter. The worse news: it's now letting 5,000 employees go, on top of the 2,000 cuts that had been previously announced. The very worst news: its BB10 operating system—and last hope for relevance—has been pushed back until next year. Look, companies lose money all the time. It's rough economy, a competitive space. It happens. But what's crucial during times like that is to have a clear way out. The only chance RIM had at surviving as a standalone company was for BB10—which remains promising, if not revolutionary—to lead a BlackBerry renaissance. Waiting until this fall, as had been previously indicated, was pushing it. Waiting until 2013 is suicidal. Then combine that with the revelation that RIM's cutting 5,000 jobs, making 7,000 total in the last two months. Add in net income losses in the hundreds of millions, revenue down by 33%. BlackBerry PlayBook shipments of 260,000. An app store with just 89,000 offerings—less, even than Windows Phone 7, which isn't even two years old. The only number from RIM's latest earnings report that even sounds big is the number of handsets sold: 7.8 million. And then you remember that Apple sold 35 million iPhones in the first three months of the year, and that at this point many of the BlackBerrys sold are low-end phones in developing countries, and you just get all sad again. There are two ways to survive as a troubled business: either be incredibly strong but with no prospects, or be weak but have a clear path to success. 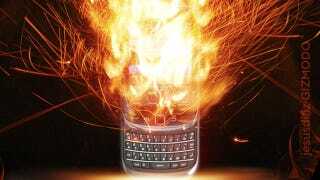 RIM's last great hope, BB10, is gone. Its current offerings are totally ignorable. All that's left is BBM, a service that's only as good as the number of people using it. A number that's decreasing by the day. So what happens now? We'll hopefully here a plan of action during the company's conference call to discuss earnings at 5 pm EST. But know this much: Either RIM goes quiet into that good night, or it goes on sale. The company's already hired "strategic advisers," who one imagines hastily advising its execs to sell BBM, sell the hypersecure server network. To salvage what it can instead of suffering this death by a thousand hatchet gashes.